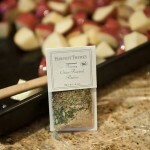 « « Navigate Toward The Past: Gnocchi Night – A success! 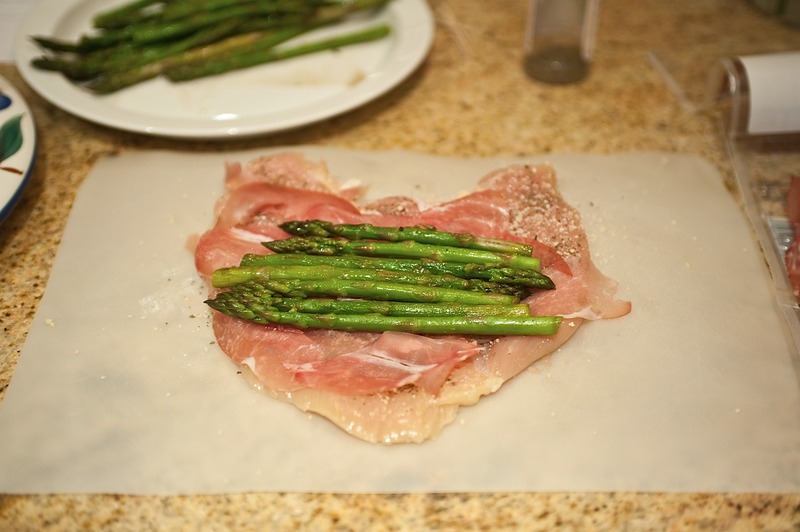 Well, I looked around the kitchen and had three ingredients, but didn't know what I wanted to make: 1) Chicken breast, 2) Asparagus, 3) Prosciutto. 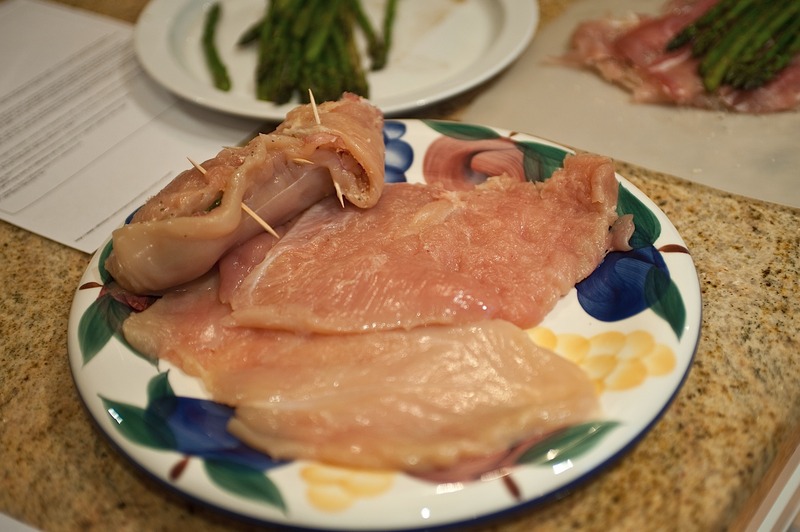 My original thought for dinner was to marinate the chicken in something and then grill them, then wrap the asparagus in the prosciutto and grille that... then make some potato dish. Sounded good on paper, but then I had NOTHING, I mean NOTHING to marinate the chicken in! 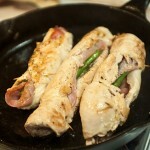 Oops... Plan B. Google Chicken, Prosciutto, Asparagus and see what comes up! 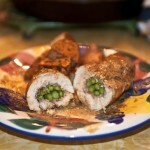 I came across the following recipe - since I didn't have the exact ingredients, I'm going to give you MY version. Much to my delight EVERYONE LOVED IT! This recipe will easily serve five (two adults and three kids)... adjust accordingly for your family size. 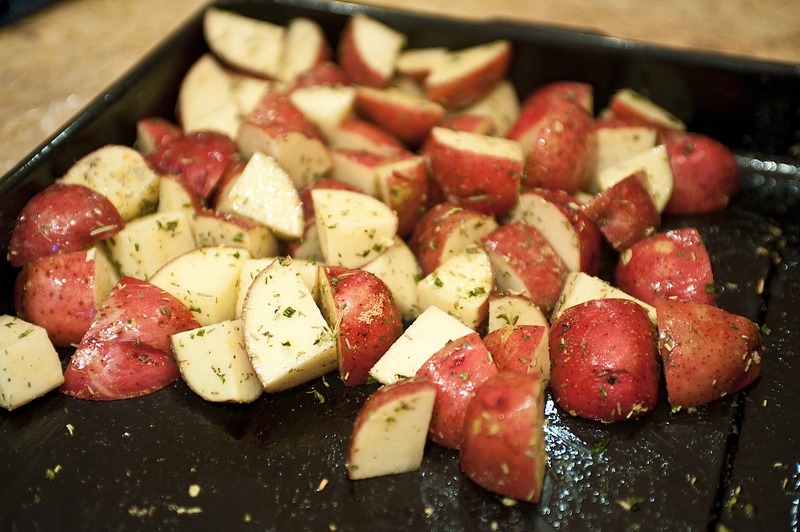 In a roasting pan, put your potatoes, roughly cut into 1" cubes. 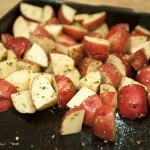 Put just enough olive oil to cover the potatoes, then add seasoning. 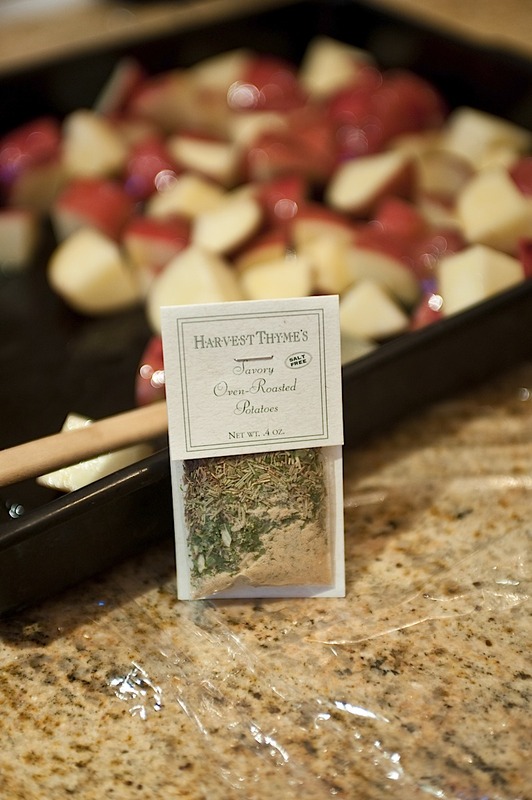 I used a packet of seasoning we got from Yankee Candle (called Harvest Thyme, basically a thyme/rosemary/parsley/spice pre-mix)... coat the potatoes with the seasoning and put in the oven uncovered. Heat a 12" ovenproof skillet - I use a cast-iron skillet, it's just perfect for this type of meal. 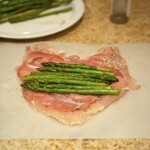 Over medium-high heat, add about 1 1/2 Tbsp of oil and add the asparagus. Season with salt and pepper to taste. 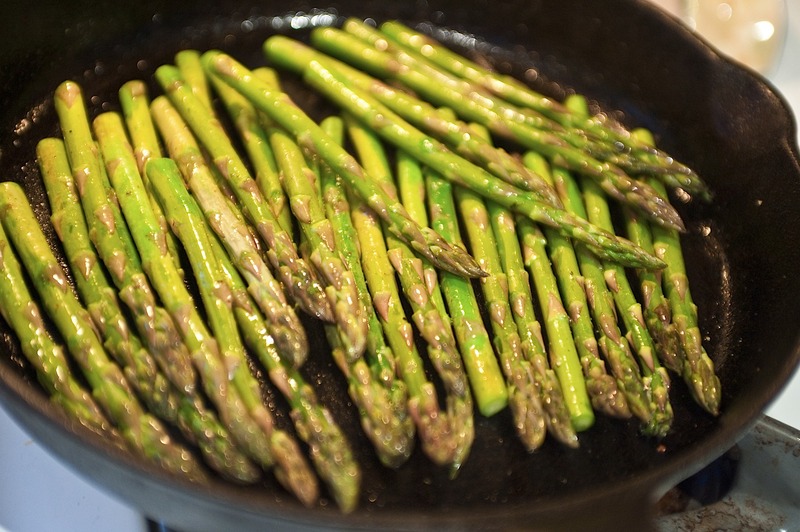 As the asparagus saute, shake the pan often to prevent them from burning. You don't want to overcook the asparagus! 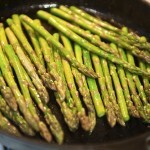 I find that adding a bit of liquid, say a 1/2 cup of water, at the beginning helps steam the asparagus while it cooks. Take a taste after about 2 to 4 minutes. You're looking for "al dente" NOT mush. So if they still have a bit of crunch, they're probably done. Remember, they're going to cook a bit more when you put them in the chicken. 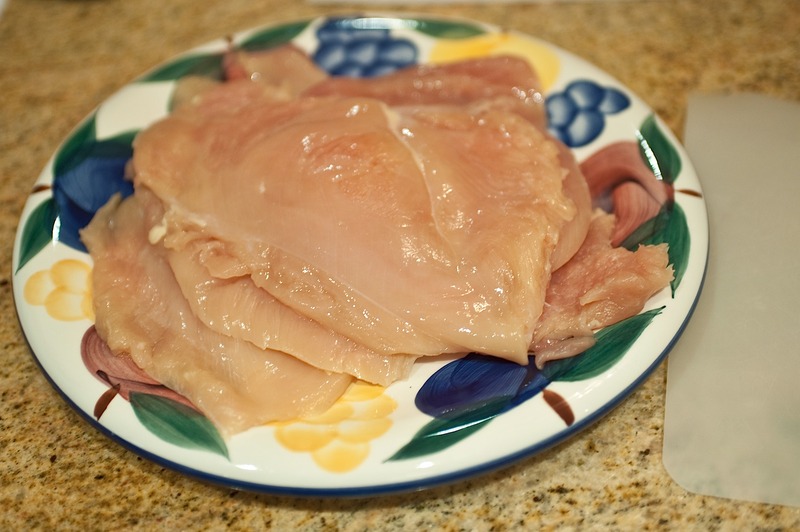 Lay the chicken on a cutting board OR better yet, I put plastic wrap on my counter (granite) and put the chicken between another piece of plastic wrap to hammer them to a consistent width. 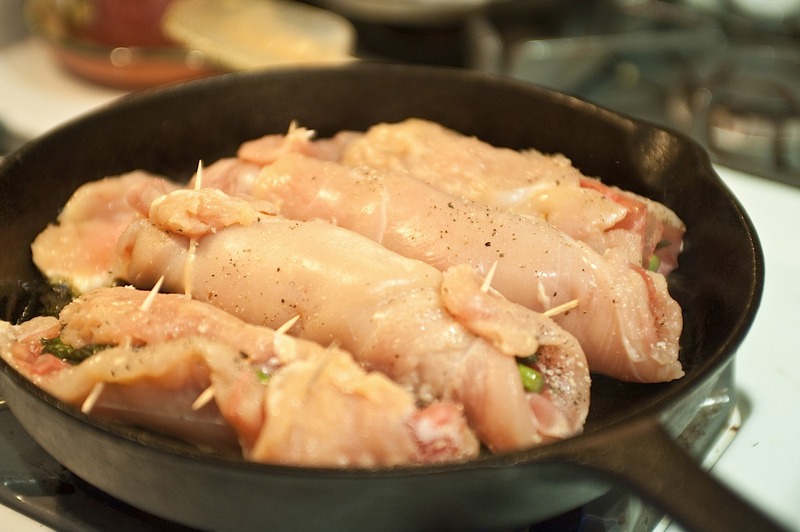 Basically, you want to pound out the breasts until they are a uniform thickness so they cook evenly and are easy to roll out. 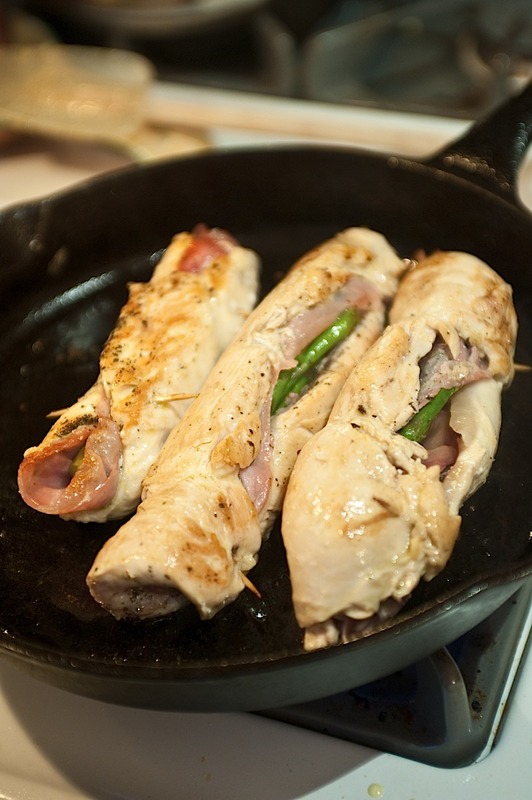 Use a meat mallet or a heavy skillet to flatten out the breasts. When they are all pounded out - lay out the breast long way (from right to left, not top to bottom) and start arranging an even layer in this order: a light but even sprinkling of dried basil, a light but even layer of the parmesan cheese, prosciutto, and then the asparagus. 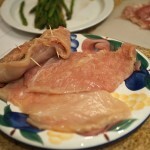 I used enough to cover the middle portion of the chicken - depending on how big, between 6 and 8 asparagus spears. 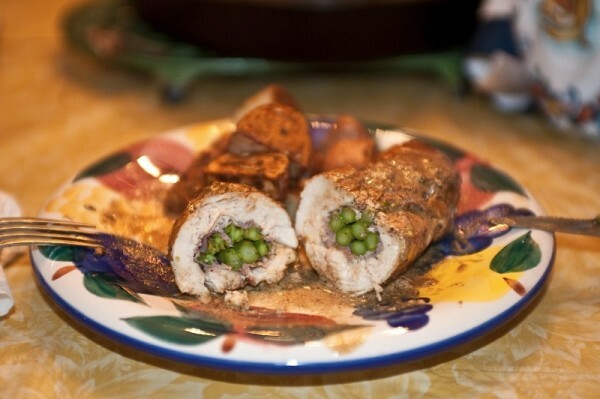 With the long side of the breast facing you, roll the chicken away from you, folding it tightly over itself. Use a couple of toothpicks (or more) to seal the rolled area. Season with a bit of salt and pepper. Put the skillet back on the heat (medium-high) add about two more tablespoons of olive oil and put the chicken rolls in. 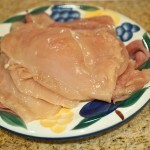 Cook the chicken on all sides until they are browned, about 3 minutes or so per side. Remove chicken to a plate for the moment, and add the two tablespoons of balsamic vinegar. Scrape all the chicken that might have stuck to the pan and let cook about a minute - now add the 1/4 cup of water. Put the chicken back into the pan and coat with the mixture. Loosely cover the chicken and put in the 375F oven. Give them a good 10-15 minutes... basically once the potatoes are done, the chicken is done too! The only thing missing from the recipe was that there wasn't really much "sauce", so I took the chicken out of the pan (oh, by the way, that frickin' pan is 375F HOT, use kitchen mitts and for goodness sake DON'T FORGET the PAN IS STILL HOT - I burned my hand!). I added about 1/4 to 1/2 of light cream and let the mixture cook a bit - I could have probably made a better sauce, but it was SO GOOD! I'll work to perfect the sauce someday, but for now, it's quick, simple and everyone loved it! Let the chicken rest for a couple of minutes, cut the rolls diagonally (because it makes it look so pretty) and serve with a spoonful of the sauce. OR do like we do and serve from the pan and we all dip into the pan for the sauce!